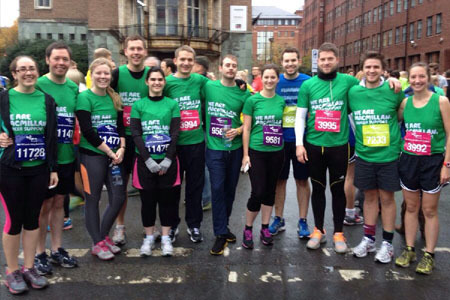 Yesterday 10 members of GWP lined up to take part in the 29th Leeds Abbey Dash 10k race, to raise funds for Macmillan Cancer Support. It’s great to be able to confirm that we have now raised over £600 so far for the charity. Macmillan Cancer is a cause that members of staff felt we needed to support this year following the support and assistance the charity have given one of our colleagues, who’s partner was diagnosed with A Non-Hodgkins lymphoma earlier this year. They are all doing well at this difficult time and we wish them all the best for the future. The weather was kind for the race and provided good conditions for some great personal performances. Architectural Assistants Laura Daniel and Zoltan Deak, were the first two runners of the group over the finish line in 42.42 and 44.57 respectively, with GWP Project Services Director, Barry Rankin not far behind in 49.07. If you would like to donate to Macmillan please head to our sponsorship page or Macmillan’s website.